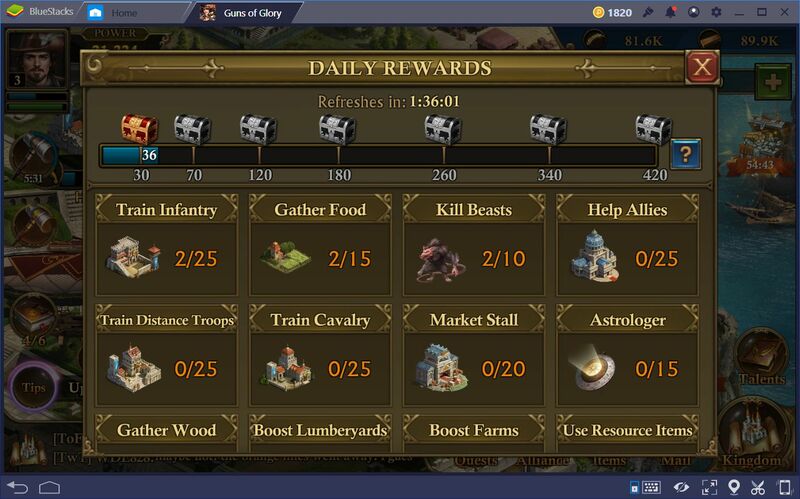 In order to succeed in Guns of Glory, you’ll have to create a systematic routine that will allow you to make steady progress in your settlement, while also ensuring that you have sufficient resources for the upkeep of your army at all times. At most times, this is achieved not through upgrading buildings and spending resources left and right, but through the careful management and proper planning of your city, much like other RTS games. In this sense, this game somewhat resembles a city-building sim, in which you must carefully plan out and construct your city, or else risk going bankrupt and suffering a Game Over. In these couple of guides, we will go over the basics of managing your city, as well as explaining some routines that you may use to build a powerful, self-sustaining estate, while also maximizing your resource gain throughout the entire game. The in-game tutorial is, oddly enough, very good at getting you started, which is rare in these types of games. 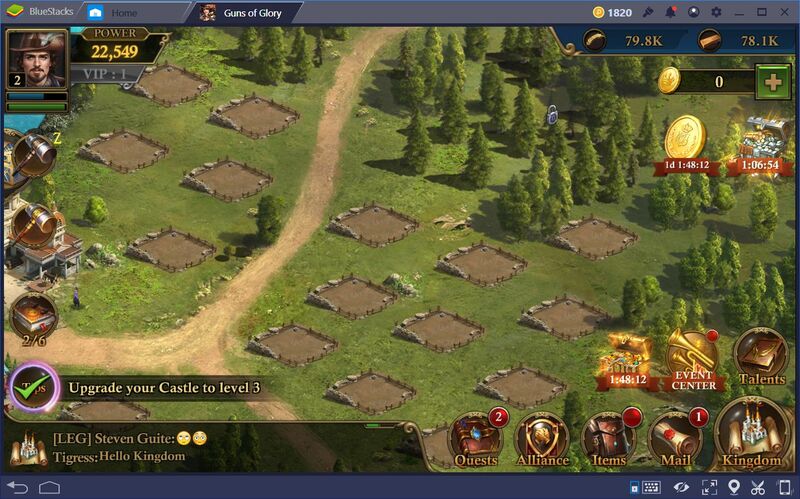 By the time you complete and take every beginner tip to heart, you should end up with your castle at around level 10, which is a great starting point for the beginning of your powerful empire. However, you may notice that, after the training wheels are off, and you’re left to fend for yourself, progress in this game might screech to a halt. For many, this is where the game starts to feel boring, and where most of them might want to quit outright. However, those who manage to power through this phase might find unspeakable power and many hours of fun as they advance their cities and begin to raid their neighbors to plunder their resources. With that being said, resources are the single biggest bottleneck to progress in Guns of Glory. We can’t stress this point enough. If you are not able to create a good foundation for your estate, which revolves around many resource collectors, as well as diligent gathering and planning, you will suffer through much anguish later on. And we’re not even talking about the long construction times that most mobile gamers have, by now, gotten used to. We’re talking about not having enough resources to get anything done. As we mentioned before, the tutorial will explain the basics of the game, including the training of troops, how to build and upgrade buildings, and how to acquire resources for your army and for the construction of your estate. However, while you were likely making steady progress in your city during the tutorial, you will see that, after you’re done, progressing further will become much more difficult and costly in terms of both time and money. Now that you’re left to fend for yourself, it’s time to kick your production into overdrive. 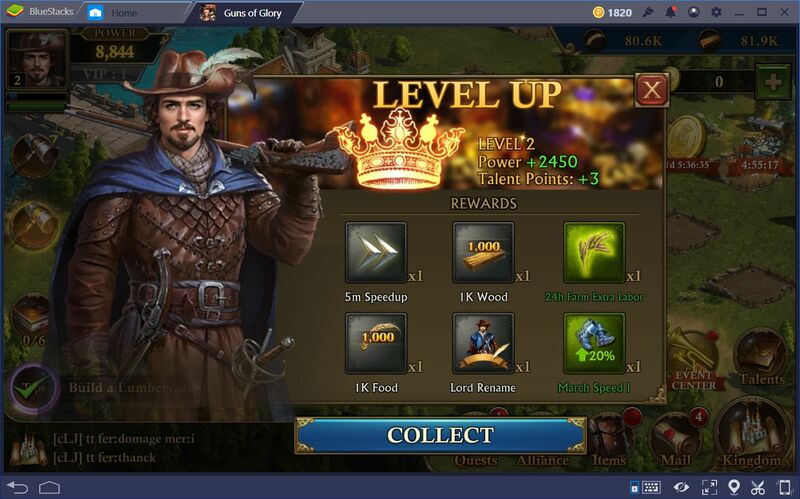 The best way that you can secure enough resources for all your needs in this game is by simply keeping each and every resource collector upgraded to their maximum level that your castle allows. You can do this by making them your top priority on your to-do list right after you’ve upgraded your castle. You might find that this method makes it quite easy for you to passively save up enough resources for everything you’ll ever need and, for the most part, you’d be right. However, as you progress through the game, and the costs for everything increase, you will find that it’s not only harder to meet resource prerequisites, but that it’s also very difficult to keep said resources safe from enemy attacks as you’re saving up. Quests: By performing simple daily tasks, you can score a decent amount of resources, which can definitely add up if you’re diligent with these tasks. Furthermore, the resources you obtain as a reward for performing these tasks come in the form of usable items, which cannot be plundered by enemy attacks. These resource packs are better saved for when you need to spend them immediately, in order to minimize the risk of having them stolen by your enemies. Hunting: The kingdom map is littered with many enemies, both beast and human alike, which give plenty of rewards upon being defeated. If you are able to raid and destroy these units, you will receive lots of interesting prizes, including resources in the form of packs, which you can use at any time. The Red Guard camps are a bit more complex to attack since they require you to rally with your teammates before engaging them in combat. However, the rewards they give upon defeat are better than what your run-of-the-mill beast drops. We’ll explain more about these mysterious camps on another occasion, so stay tuned! 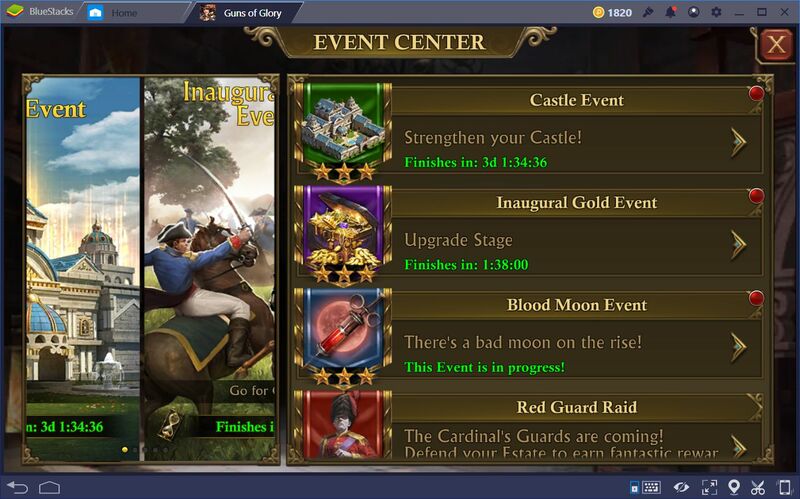 Events: In this game, you will periodically be able to participate in many events, which give you a chance to earn prizes in the form of resources and other useful items. Make sure to visit the event center often in order to keep updated on the latest events and opportunities to score some easy loot. As you may know by now, your main source of resources will always be the resource collectors such as the farms, lumber yards, iron mines, and silver mines. However, when it comes to these buildings, we need to stress the importance of the farms. 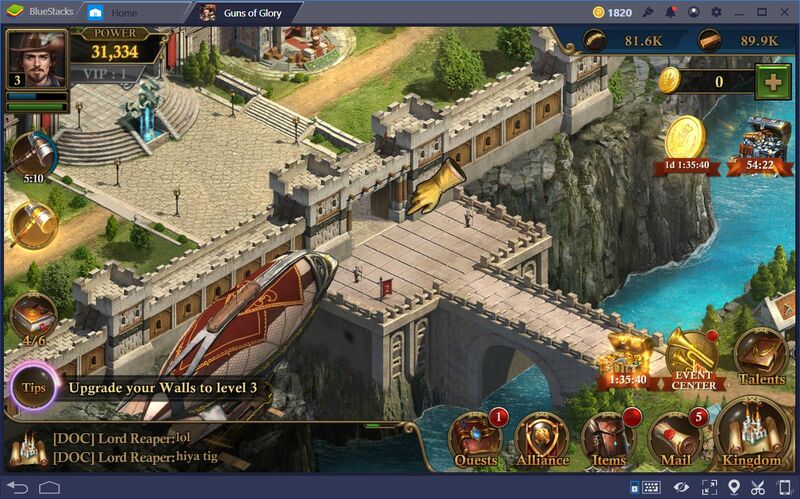 As your army grows, and you continue to train more troops, the upkeep cost will also increase. The upkeep cost is a periodic food payment that is automatically deducted from your reserves, in order to keep your soldiers fed. In this sense, if you’re looking to grow your forces, you will need to invest equally on your farms, both by constructing additional instances of these buildings, as well as keeping them upgraded to the max. 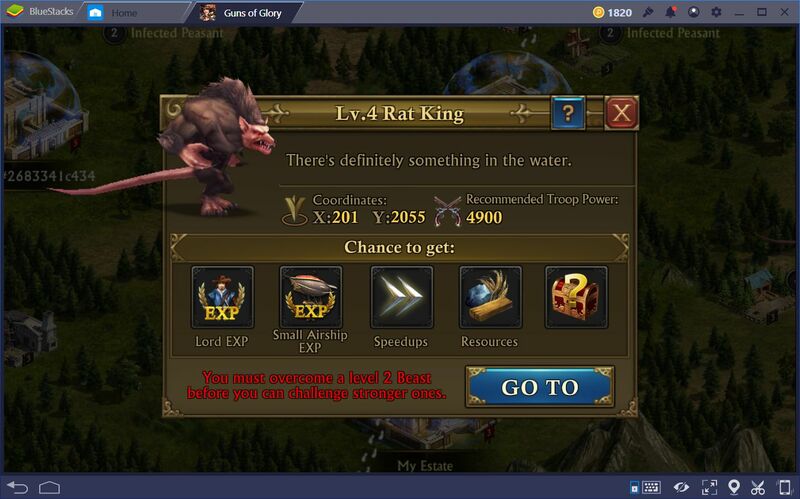 Furthermore, you can also invest in several talent upgrades with the talent points you receive from leveling up. However, as a general rule of thumb, we usually don’t recommend investing in the “economy” branch of the talent tree, as these provide bonuses that you could easily make up for by simply playing the game regularly. Try to save your points to invest them in the “war” branch, which will give you awesome bonuses to improve your battle capabilities. 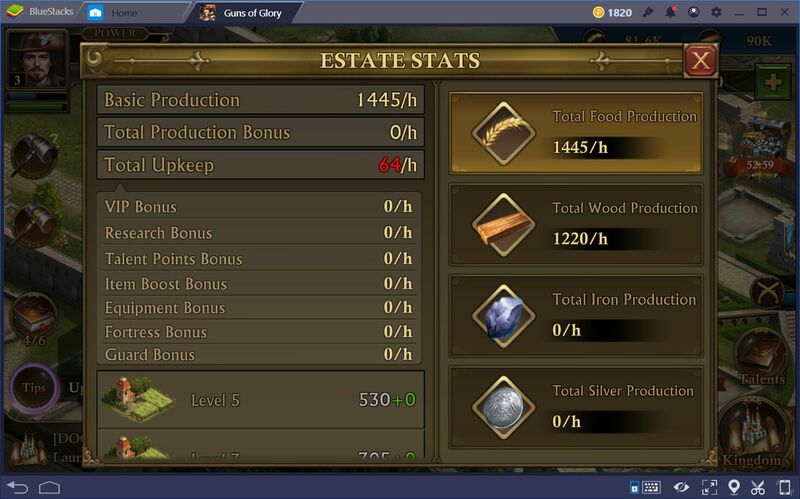 You can always consult your upkeep costs by clicking on your castle, and then on “estate stats”. 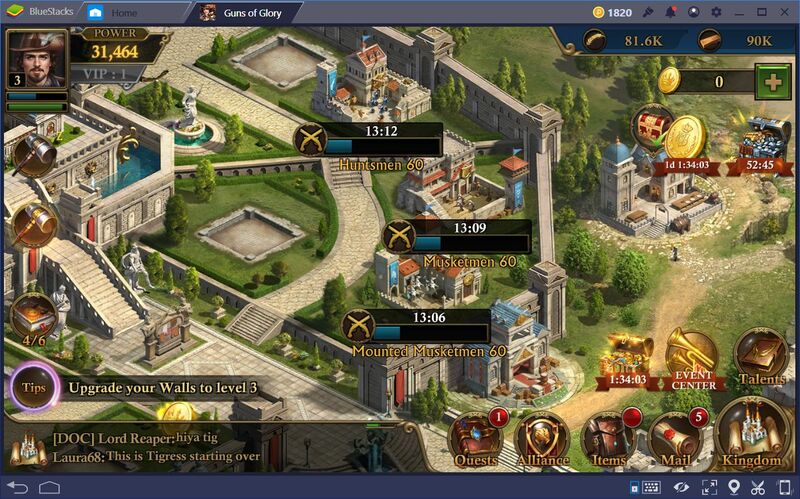 Luckily, training troops is one of the best ways to increase your power in Guns of Glory. However, you can only achieve this by creating a self-sustaining estate; one that is capable of producing all the resources necessary to maintain its armies, and still have enough left over to invest in upgrading its buildings. You may also be interested in Part 2 of this guide, where we’ll explain further how to safeguard your resources, and increase the number of troops you can deploy in order to maximize your odds of success at ransacking and pillaging enemy camps.